Vivian Saliba joins Chris Moorman, Sofia Lovgren and Dominik Nitsche as an 888poker ambassador. 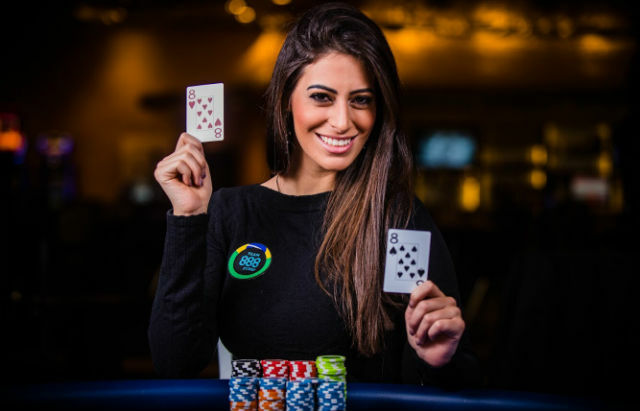 888poker continues to build its talented team of sponsored pros with the announcement that Brazil’s Vivian Saliba is its latest brand ambassador. The 24-year-old from Sao Paolo burst onto the poker scene this summer at the World Series of Poker when she had a deep run in the $10,000 Pot Limit Omaha Championship for a career-best score (11th – $47,923). She was also the youngest female to play in the Main Event this summer, finishing 421st for $27,743. Saliba considers herself a PLO player first and foremost, having enjoyed a handful of scores in the game at Brazilian Series of Poker (BSOP) events over the years. She’ll now join the likes of four-time bracelet winner and recent One Drop High Roller champ Dominik Nitsche; the PocketFives leading all-time money winner Chris Moorman; high stakes tournament pro and Twitch legend Parker ‘Tonkaaaa’ Talbot; Swedish pro Sofia Lövgren; and her fellow Brazilian Bruno ‘Foster’ Politano on the 888poker team. “I couldn’t be happier about joining,” said Saliba. “As a professional poker player, I always looked forward to a partnership. 888poker is one of the biggest poker companies, and I am very fortunate to be a part of it. I am ready to give 100% and see us both growing together. Saliba was introduced to poker by her father, who she began playing with in local Brazilian card clubs at the tender age of 17. “My first contact with poker was on a family trip with my mother, dad, brother and sister when I was around 12 years old,” Saliba explained. “We used beans as chips and made the bets. It was so much fun. I won a lot of beans back then. Turning pro five years later at the age of 22, Saliba began to find success on the Brazilian tours, and has since amassed career earnings of just under $200,000 at the time of writing.